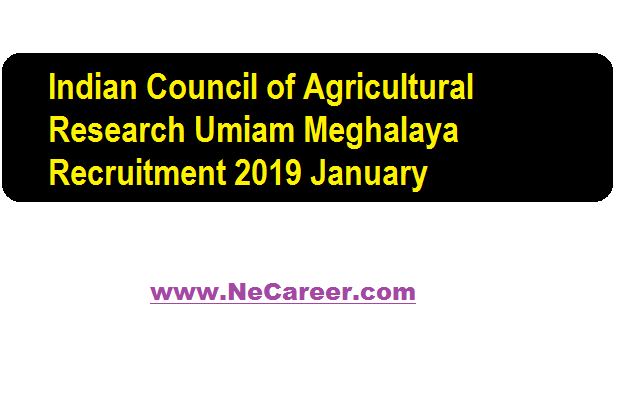 ICAR Umiam Recruitment 2019 January :- Welcome back dear job aspirants.You are visiting North East India's No. 1 Job Portal www.NeCareer.com . Today we will be discussing a new vacancy in Meghalaya State. 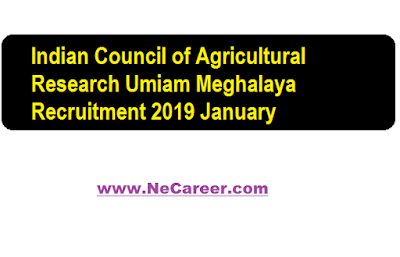 Indian Council of Agricultural Research Umiam Meghalaya has issued a recruitment notification for engagement of various posts.The detailed vacancy is discussed below. Geo-informatics/ Hydrology/ Remote sensing-GIS/ Information technology/ Computer Science and 2 years Of research experience. Candidates must be Ph.D or M.Sc passed. Interested and eligible Candidates fulfilling the following eligibility conditions are invited to attend Walk-in-interview to be held on 4th February 2019 at 10.30 am in the ATIC building of Hqs. Umiam. Note : These posts are purely contractual posts under the Project ‘National Innovations in Climate Resilient Agriculture (NICRA)’.